Book selection by Library Manager Stephanie Moran. In a society dominated by capital, we are used to measuring our health in relation to our productivity. What strategies can artists and activists use to oppose this? The next Research Network will revolve around how artists attend to self-care in an economic climate of austerity and instability. It will address tactics for reclaiming control and responsibility as a way of rejecting institutional exploitation, when financial, mental and physical precarity is the accepted state of being for artists. How do artist and activist collectivities provide structures for support and self-care and protection against burnout? What is the artistic obligation to social responsibility, engagement and ethically conscious practice? Who or what does the artist have a duty to? Does it benefit the artist? Is it ethical for precarious artists to fulfil societal roles that should be paid for by the state or other institutions? 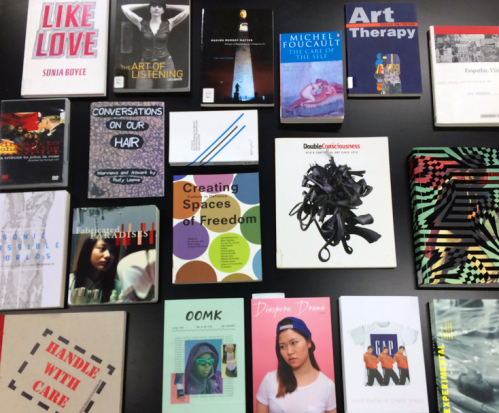 The Stuart Hall Library is now looking for proposals for research network events to take place February – December 2018, as part of Iniva’s artistic programme, around the theme of self-care. Proposals are encouraged from artists, curators and practitioners working in the fields listed above. We can provide some support in terms of marketing, coordination and limited technical support and equipment – please take into account when submitting your proposal and contact the Library Manager if you have any questions about available equipment.